I just returned from a loop in the Mojave Desert, I started at Josua Tree then the Mojave Natural Preserve, highway 95 to highway 62 and back into Joshua Tree. 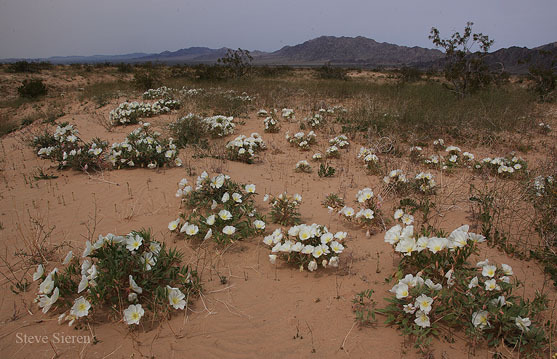 I didn’t find much for fields of wildflowers but I did many different species over 15 different kinds scattered about the low desert areas. Mostly 1,500 ft or lower and I had to walk it quite a ways into some of the wilderness areas to get to them. Highway 95 had the most variety and some in clusters. There are plenty of buds that haven’t bloomed yet and the temps got into the low 80’s, so there is still hope for the desert. Here is mid day shot while scouting scenes for our Joshua Tree Workshop. If you would like to invade this pristine little dune heaven and leave no trace (besides your footsteps) with me before the desert iguanas eat them all, contact me. We’ll have the place all to ourselves. Otherwise, I hope you enjoyed the photograph and vague description. This entry was posted on March 21, 2010 at 3:45 pm and is filed under Uncategorized. You can follow any responses to this entry through the RSS 2.0 feed. You can leave a response, or trackback from your own site. Great shot – and hey, can I get your autograph? I get my latest copy of Outdoor Photography and there you are!! I was there Friday and unfortunately did not see much out for wild flowers you must of searched high and low for such a concentrated amount of rare flowers (for the area) so early in the wildflower season. Can’t wait to see what you might of come up with if you so chose to return. Ooh, I need to calibrate my lap top the shot is a little grey but it’s was just a scouting shot so I won’t spend the time with adjustments. Thanks Derrick, I only had a day to shoot that image. Little Jenny! You know I did search high and low for the primrose. I made it back about 5 days later and they were still holding on slightly wilted but still very photogenic. Thanks for stopping by, I’ll send you an email and let you know where they are. I’m jealous that you have such great scenery to shoot regularly. Fantastic stuff, really!